Ridango, a transport ticketing systems provider operating in several European countries, has been certified by EMVCo to accept bank card payments in one of their most popular ticket validator models. Artec Design has been supporting the process from the beginning by making the device compliant to EMV requirements and improving the manufacturing pipeline to comply with the payment terminal quality management standards. 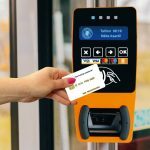 Tallinn will be the first city to benefit from the certification, as contactless payments with MasterCard and Visa cards will be launched during Q4 2018. For further information, please read the news report from Ridango’s webpage.